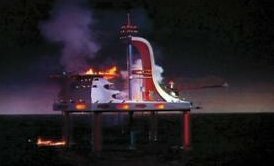 From Irwin Allen's 1971 film, "City Beneath the Sea" this huge wooden futuristic oil rig miniature, painted red, used as part of an ocean-based oil rig platform which was destroyed in spectacular fashion. Prop measures approx. 6 1/2 feet tall.